I drank this Monday night for dinner. I didn’t feel much like cooking. I was still catching up from the weekend fun. I think I was in bed by 9pm. I am getting old. I had just finished running. One more episode of ER watched. Am I the only one that watches ER while running? If the sight of Doctor Ross doesn’t motivate you, I am not sure what will. That man has aged well. Very very well. However, he did look much younger in 1995. But didn’t we all? I am glad I ate light Monday night, because tonight (Tuesday) I ate like a pig. Oink OINK. I am not exaggerating. Italians know how to eat…I think my stomach is Italian. Mel and I went to another cooking class and for 2+ hours we ate. The menu’s main focus was on the spud. Potatoes. Pommes de terre. Patata. We started with potato breadsticks and dipped them into potato leek soup…I was literally eating a carb with a carb. Oh my word! We then swiftly moved onto potato gnocchi which was smothered in a light tomato and basil sauce. I could have eaten this all night long, but there was more to be had. From the gnocchi we went straight to the main course…roasted chicken with roasted potatoes, garlic, and olives. Mel went bonkers for the whole roasted garlic cloves. The chicken was served with a creamy potato dauphinoise. People…let me tell you, this was decadent. We are talking layers of thinly sliced potatoes. Layers upon layers. And in between said layers…there was butter and cream and all things good. Gruyere cheese topped the whole potato shindig. I think this is when I went into a carb coma. For the rest of the night was a tad blurry. But wait…we had more to eat! Twice baked potatoes were up next…Yukon gold, russet, and sweet potato. We were so delirious and giddy aboute nearly forget about them in the oven! And finally, for dessert, we had sweet potato bread pudding with a warm caramel sauce. When no one was looking….I licked my plate. After eating that much in front of strangers…well they are no longer strangers. More like partners in crime. I might be stuffed this time next week. Not joking. I am going to drink this smoothie for the remainder of the week. Light and healthy. Quite the opposite of tonight. Coconut milk and almond butter. 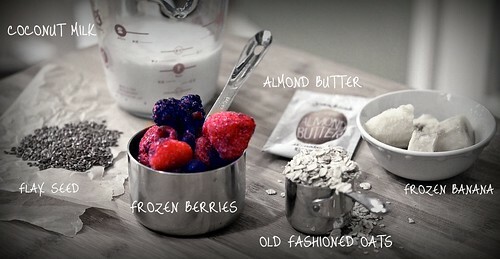 Frozen fruit and oatmeal and flax seed. All good things. All healthy things. No potatoes. 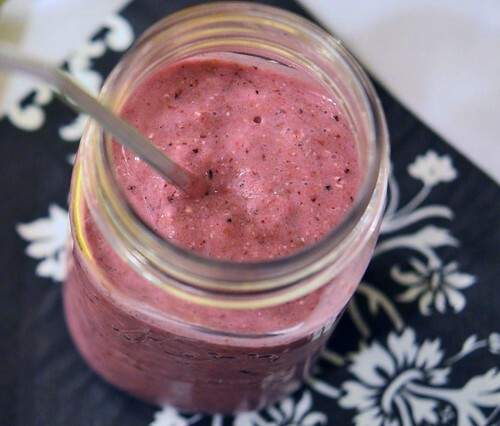 My recipe makes enough for one large smoothie – perfect for a quick meal/breakfast on the go. Or it makes enough for 2 small smoothies. For those of you who like to share. OK…enjoy the smoothie…I will am going to roll myself off this couch and up the stairs and into bed. Oh potatoes…. 1/2 Banana – preferably frozen, peeled and thickly sliced. 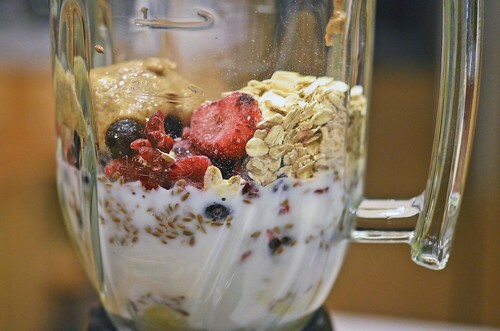 Place all ingredients into a blender. Blend until smooth. 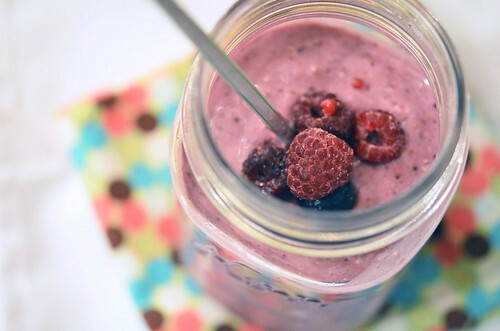 Pour into glass, top with extra berries, and enjoy!